I find this an interesting read. In August of 2014 I did 100+ from South Lake over Bishop Pass to Whitney Portal after meeting up with my two daughters at the JMT trailhead from Bishop Pass. So the next day.. my day 2 was over the golden staircase, so I can say that for me was the most challenging climb I have done with a 52 lb pack.. I was so slow that day. And I also agree that the climb out of Guitar lake to Whitney was also very big. We left guitar lake at 230 am and got to the summit by sunrise. I would like to return next summer and do more as a graduation gift to myself from graduate school. Probably solo 🙂 Thanks! Thanks for the comment, Julie. You are right, the Golden Staircase with 52 pounds is a horse (marmot?) of a different color! I had slightly different takes on all 3. With an LYV permit, most of that almost 6000 feet from the Valley to Cathedral Pass was my second day. Toughest day of the trip: I didnt have the fresh legs and Curry Village breakfast of Day 1. It did help, however that I had more days before Donohue. Strategy on Bear Creek switchers was VVR and Bear Creek Cutoff. Great call for me. Switchers were not so much intimidating in themselves, but involved a thousand feet or so that then drop down to meet the Bear Creek trail before heading back up again. I avoided the up and down, had a great zero and resup, and a much prettier hike by taking the VVR ferry and Bear Creek trail. I guess I was as Ray predicts in better shape for the Golden Staircase. I stoppped to chat with a trail crew on lunch break and casually asked how much farther it was to the GS. “You just climbed it” came the response. Oh. BTW, both my recollection and my map put it in the middle, not the last part of the climb from Palisade Creek to Mather. I love the Golden Staircase story, Peter. Thanks for the comment! All three are equally interesting parts of the trail. The rewards at the ends of those climbs make them much easier…..at least psychologically! Glen Pass is a climb in itself, and if you do both Glen and Forester in one day, then it is a challenge. Yes, Guitar Lake up is a good climb. What got me easily up that was the thought of dumping my then quite light pack at Trail Junction and having an easy walk to Whitney. The greater challenge was the 99 switch backs down from Trail Crest and the seemingly endless 6.5 miles from there to Whitney Portal. Yikes! Longest 6.5 miles on the planet! Agree on all, Ken. Glen is tough and the middle-third of the descent from Whitney is brutal. Thanks for the comment! Our big day was half dome and going over clouds rest in the same day. 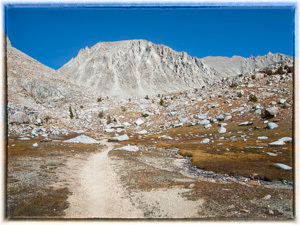 Not on the “official” JMT but this long day was big in elevation change and it prepared us for the rest of the trail. Nothing else was as tough as that day. Yep…that’s a heck of a day of hiking. The exposure adds some “mental” fatigue as well. Nicely done and thanks for the comment! Oh dear, you nailed two of my three toughest days…Bear Ridge and the Golden Staircase. I found both to be an absolute grind! Oddly, I didn’t find Guitar Lake to the summit Mt. Whitney to be nearly as challenging as I expected…must have been the adrenaline! Regardless, three rough days out of 23, no complaints. Best 23 days of my life! Congratulations, Julianna, for seeing it through despite the grind. It’s all put in perspective from the top of Whitney! Thanks for the comment.